American Youth Football (AYF) is the largest youth football organization in the U.S. and represents a wide cross section of participants aged 5 to 15. Since 2000, AYF’s endorsed insurance provider, Sadler Sports & Recreation Insurance, has collected information on 20 injury categories. The data for each category was input into a database and reports were generated to illustrate the injuries occurring in each category. AYF constantly reviews and monitors t his information in an effort to better protect its participants. Should a particular area of concern come to light, more detailed reports can be run to determine if a problem exists that needs additional attention. For example, when concerns arose over the potential dangers of age-only vs. age/weight categories, a report was run that indicated that the risks of injuries in age-only weight categories was about the same as age/weight categories. As regards concussion concerns, AYF will track the frequency of concussions to total injuries over time to determine the impact of parent/player education, coach training on concussion recognition, return to play policies, and improved tackling techniques . Due to the limitation of this study, it tends to understate minor injuries that were never reported and tends to overstate the more serious injuries that required medical treatment. However, it does represent a statistically significant overview of the frequency of injuries that occur within AYF and youth tackle football as a whole. Note that many of the less serious injuries were never reported as insurance claims. As a result this category tends to overstate the length of time of absence from play. 5% finger/thumb; 5% elbow; 4% neck; 3% hand; 3% back. Note that the percentage of fractures tends to be overstated since many of the less serious injuries (sprains, bruise/contusions, cuts/scrapes, pulled muscles) are not serious enough to be reported as insurance claims. Also note that the relative frequency of concussions to total injuries is consistent with other youth football studies. 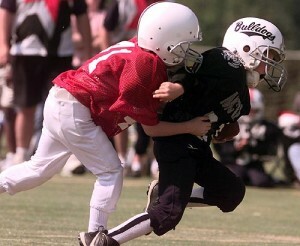 A common misconception is that most injuries in youth tackle football occur during practice. The results clearly indicate that most occur during games. Furthermore, only 28% of concussions occur during practice. Note that very few injuries occur during kickoff returns. Therefore, the kickoff rule changes implemented by the NCAA and NFL to limit concussions during kickoffs would not be as beneficial in youth tackle football. 6% collision with opponent; 5% blocked by player; 4% collision with teammate; 4% blocking player; 2% blocked from behind; 1% non-contact.